Over the past year I have been intrigued by Kumiko and the early adopters of the techniques.. Desmond King, John Reed Fox, Matt Kenney, Mike Pecovich, others. The detail of the small components fitting together is what fascinates me. I told myself that after completing a few other projects I would experiment with this Japanese form of creating small panels with intricate motifs. So much so that I made it a 2019 resolution to get going on this. 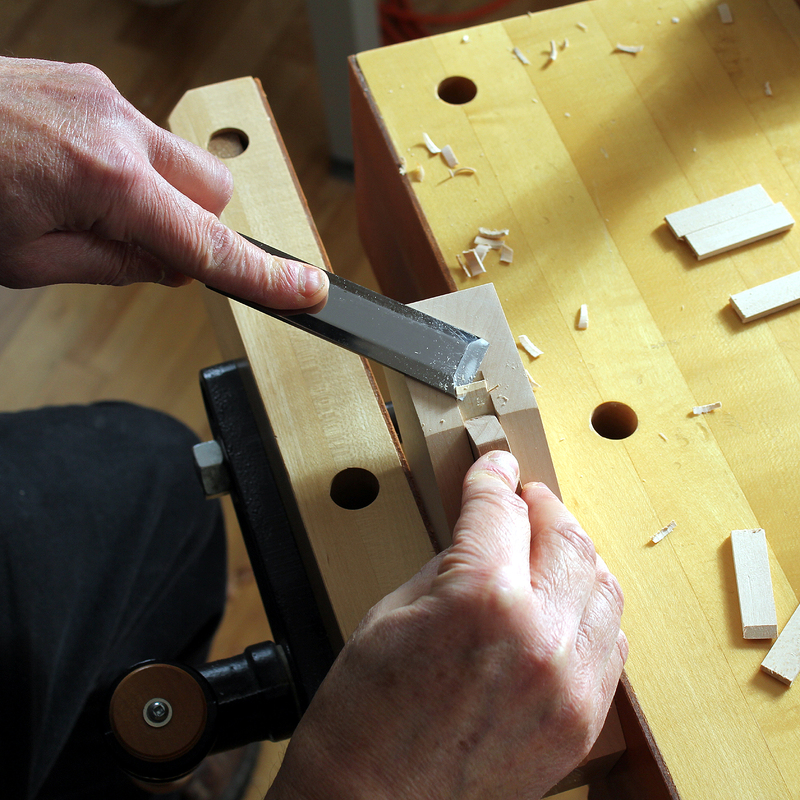 So early in the New Year I began by creating the Kumiko jigs or guide blocks (2). Guide blocks are used to pare accurate bevel angles into the ends of the Kumiko components forming the pattern or motif. Without guide blocks I don't see how this can be done successfully using hand tools. As with any other project, good stock prep is key to successful fitting of the small components together. 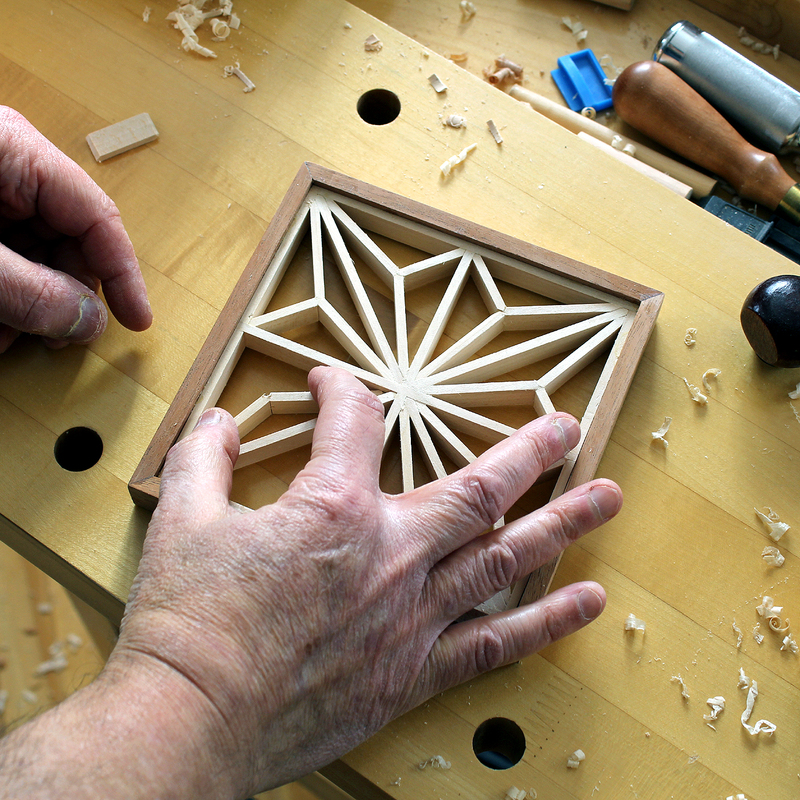 The guide blocks are closely based on a Mike Pecovich article on the subject of Kumiko. The pattern or motif I selected is one of the standard Kumiko patterns, the asa-no-ha pattern. Based on a regular square, this geometric motif resembles a hemp leaf. As with most forms of woodworking, a methodical approach and patience is key. With Kumiko, patience is mandatory. 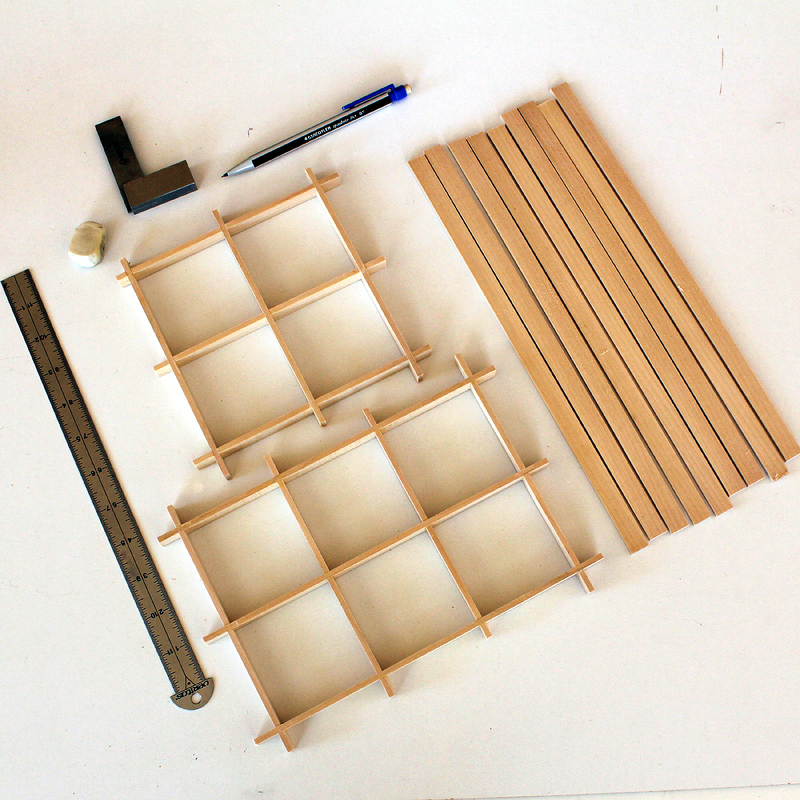 The small components can be a challenge to fit together and one of the first steps was to develop a system of preparing multiples of the same components. The following photos illustrate the process. Basswood is used since it is recommended and it does pare easily and cleanly. 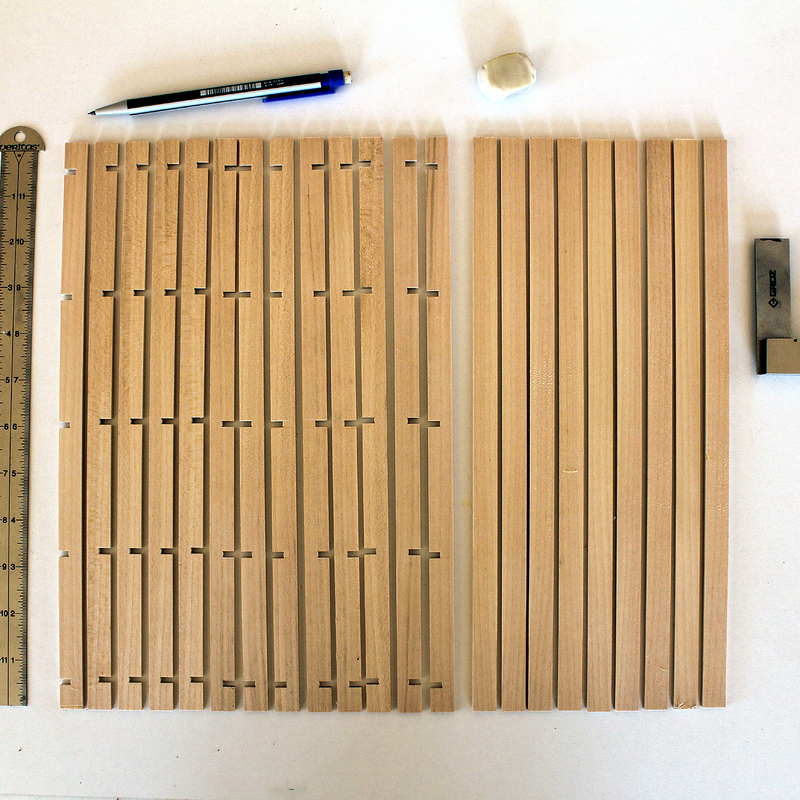 Basswood strips formed and ready to be sawn to length. Kumiko frame dimensions and spacing are arbitrary and I selected a frame size to possibly use in the future as part of a small cabinet door. Cutting the strips to length on a bench hook. I later used a stop for the small, short components. The stop ensures each of the components are similar in length prior to paring on a guide block. Kumiko frames assembled. Half-lap joints are used to perform this as they interlock. I also applied a spot of glue to each connection and the inner components. 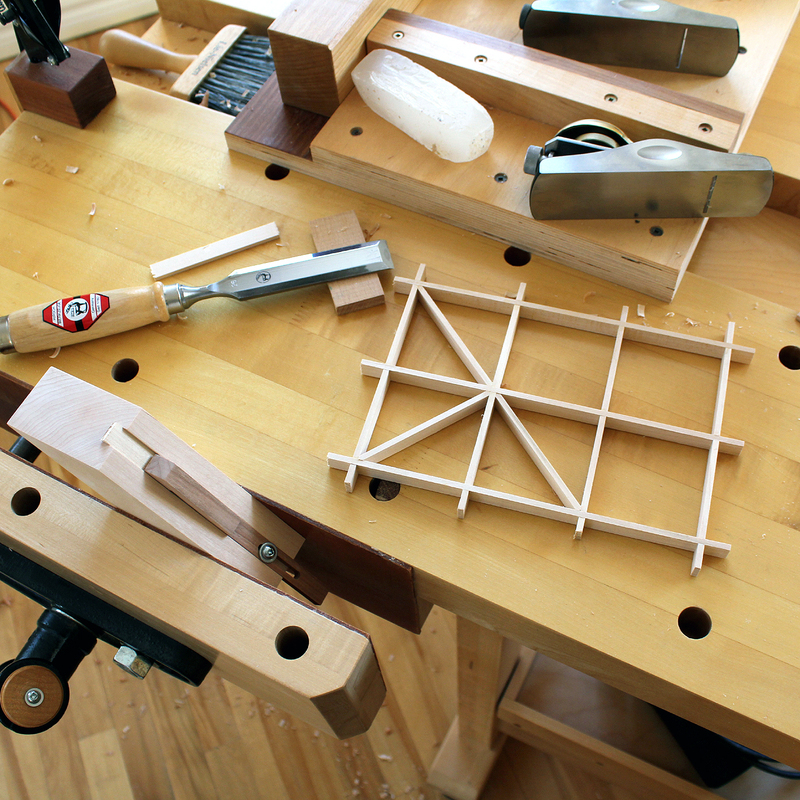 The Kumiko frames are permanent and glue keeps everything together when the extra lengths are sawn off the ends. Inserting a diagonal component into the frame. The component just had 45d bevels created on each end. Guide block (45d) and sliding stop also seen. Sliding stop assures repeatability in both bevel cuts and length of internal components. 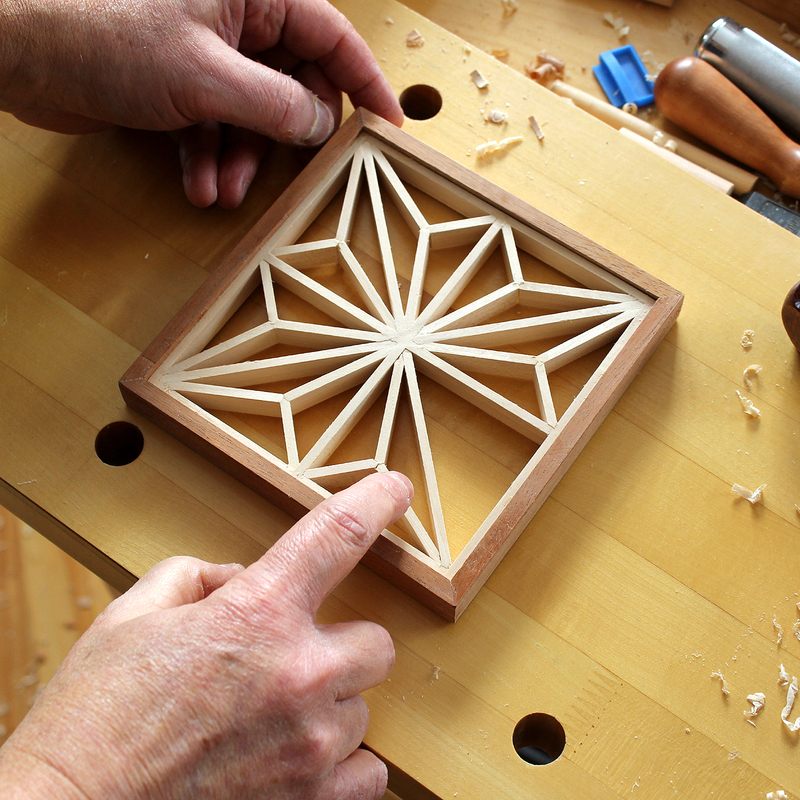 Often the fit is trail and error, but this adds to the cachet and handcrafted aspect of creating these Kumiko panels. 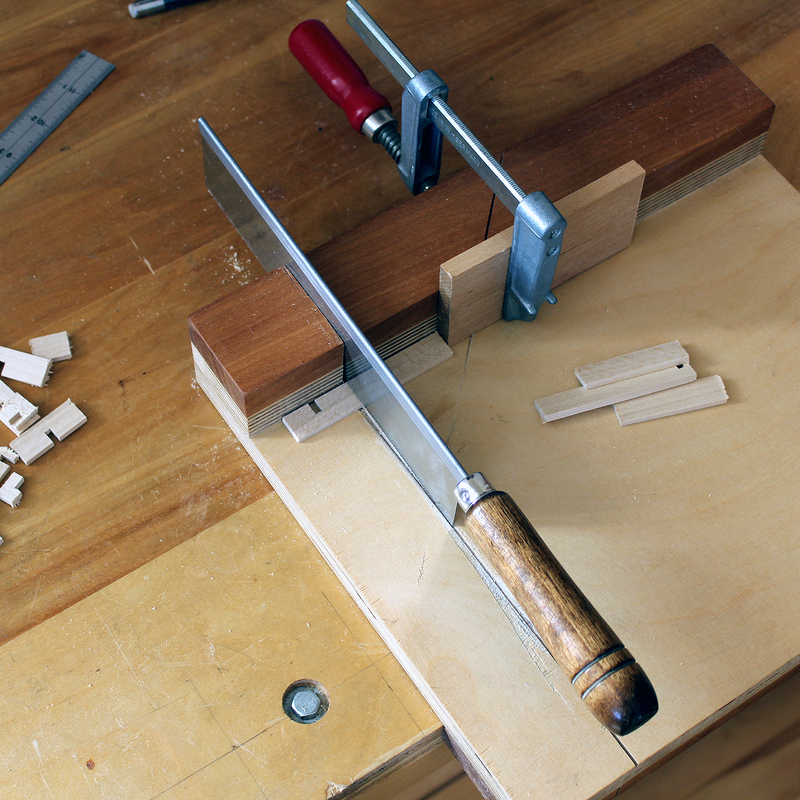 Bench hook with a stop used to create the small Kumiko components. There are so many components forming the asa-no-ha pattern that a system of creating precise multiples became necessary. Paring the small components which form the pattern or motif. A very sharp, wide chisel is ideal here. The guide block surface is used as a platform for the chisel to cleanly slice into the wood. This is where patience is key, this step cannot be rushed. Often, although the components were trimmed to size on the bench hook, some pieces needed one more swipe of the chisel or less. 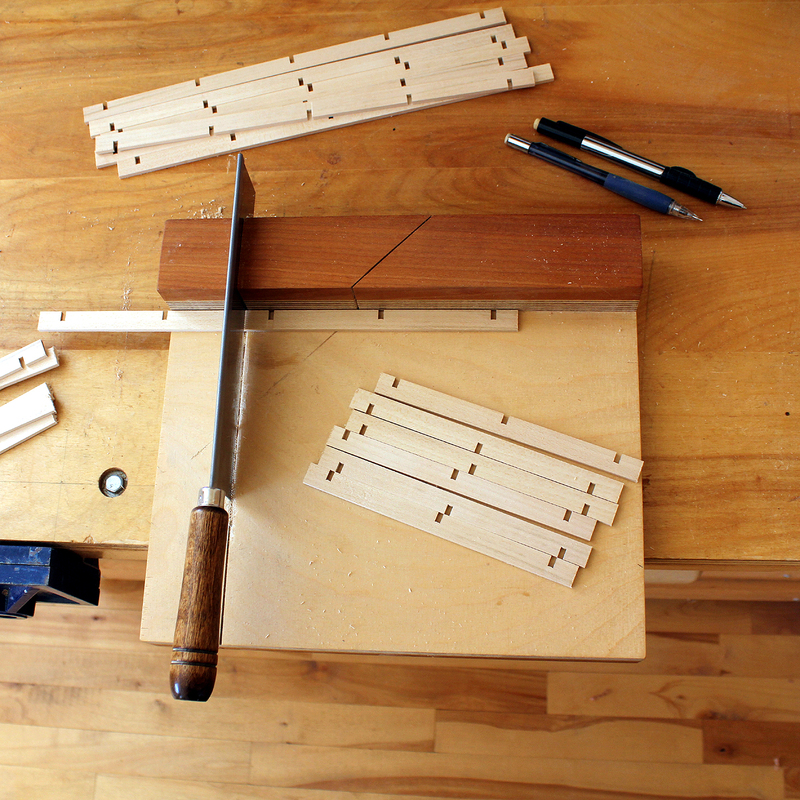 Fitting the hinge pieces adjacent to the diagonal strip. Two hinges per side begin to form the pattern where a short 45d piece locks it all together. The hinges in this photo intersect at 67.5d with bevels at the ends at 22.5d. Once you get going, the process is peaceful and enjoyable. Instant gratification results from each of the components being inserted! Almost done with this Kumiko frame. I also framed the inner basswood Kumiko frame with a mahogany surround to provide contrast and allow me to inset the frame into a cabinet door in the future. A second, larger Kumiko piece was also framed using cherry.